There are friendly smiles on the faces of the engineering students peering past their PCs and half-finished gadget designs in the Tokyo lab as I try to lift 40 kg of rice. Normally I’d worry about impending humiliation, but today I’m confident my ego will remain intact. After I squat down and a student loads bags of grain onto my outstretched arms, he presses a switch and there’s the sound of a release of air as my hips are propelled forward and my legs straighten until I’m upright — my load as light as a feather. That’s because — courtesy of those students and their teachers — I’m getting a lift from an aptly named 9-kg bionic “muscle suit” I’d been fitted with, and which is fixed to my hips, arms and shoulders by a waistband and straps. This so-called exoskeleton also features an aluminum A-frame and “sleeves” that rotate at the elbows and shoulders. Meanwhile, plates down the side of the legs counter the power injected into four artificial muscles attached to the back of the frame, ensuring you aren’t blown forward but instead raise your load like a human forklift. But this is no sci-fi bot, rather it’s one of the exoskeletons being developed by Hiroshi Kobayashi and his team of research students at Tokyo University of Science to augment able-bodied performance. This one certainly isn’t the first of its type — General Electric’s 1965 Hardiman takes those laurels — but it may be the first to overcome technical problems that have scuppered many previous projects’ commercial prospects, including Hardiman’s. In recent years there have been more successful creations, such as Ekso Bionics’ Human Universal Load Carrier (HULC) and Raytheon Corp.’s XOS 2 — both developed for U.S. military purposes. 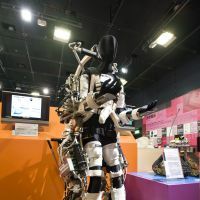 Robot Suit HAL, developed at Tsukuba University, has also attracted military interest, though a welfare version is available for rent at around ¥160,000 a month. With populations in the world’s wealthy nations all graying fast, however, there’s something of a rush to develop devices to provide mobility assistance for the infirm and disabled, and to assist staff charged with lifting patients at care facilities and in hospitals. An example of these is Israel-based Argo’s ReWalk, in which Briton Claire Lomas, paralyzed from the chest down after a horse-riding accident, completed the London Marathon in 16 days in May. There is also a growing need for such equipment in labor-intensive activities such as construction and farming — sectors where a European Union-wide study recently found musculoskeletal disorders (MSDs) such as back pain affect around 100 million citizens annually and account for almost half of all work absences. In the United States, meanwhile, work-place lumbar injuries are reported to result in around 100 million lost work days per year. While such data are unavailable for Japan, data collected by the Workplace Insurance Information Center reveal there were some 575,000 workplace injuries for which insurance claims were made in 2010. However, the cost to society is not only monetary, says Keijiro Yamamoto, a professor at Kanagawa Institute of Technology who was a pioneer developer of exoskeletons in Japan. 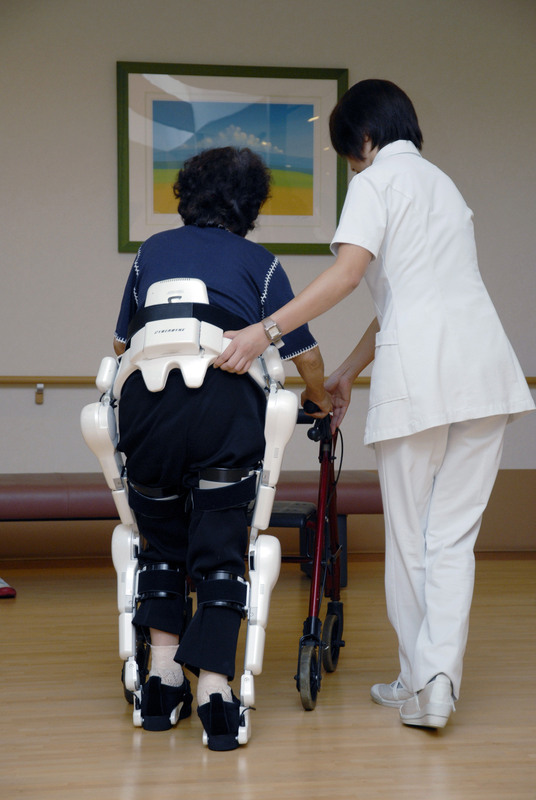 Anecdotal evidence it may be, but the veteran researcher says it is hearing about a growing number of nurses and carers having to quit their jobs due to MSDs caused by lifting patients that spurs his work. “It occurred to me that if there was a way of assisting such heavy labor via a machine, then this sort of problem could be solved,” he said. His exoskeleton would certainly lend a strong hand. Built around an aluminum frame from which protrudes a mass of wires, cables, concertina-like air bags and compressed-air lines, the suit’s limb actuators, which are powered by compressed air and triggered into motion by sensors attached to user’s muscles, can withstand up to 100 kg in weight. Previous prototypes weighed 30 kg and took users 15 minutes to put on, but a new, simplified version, which does away with the bulky air bags in favor of more space-efficient air cylinders, will be unveiled later this year, Yamamoto says. 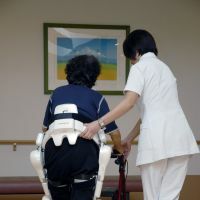 Meanwhile Kobayashi’s exosuit that helped my rice-lifting exploits takes two forms: one, which is scheduled to be commercially available to rent for around ¥15,000 per month (and is eligible to be covered by national insurance), augments the arms and lower back to enhance heavy lifting; the other targets the nursing industry. The main difference between Yamamoto’s and Kobayashi’s inventions is found in the actuators. To attain a high degree of power while keeping suit weight to a minimum, Kobayashi’s muscle suit avoids use of heavy electric actuators and hydraulics, and instead utilizes pneumatic artificial muscles (PAMs) — lightweight, mesh-encased rubber bladders — that set in motion wires and pulleys that activate the back and arm “joints” in reponse to movement sensors. Maximum power depends on how far the arms are from the body. With them close in against the torso, hefting 40 kg is a breeze. “Generally speaking, the power-to-weight ratio (of PAMs) is 400 times greater than motor-driven suits,” says Kobayashi. 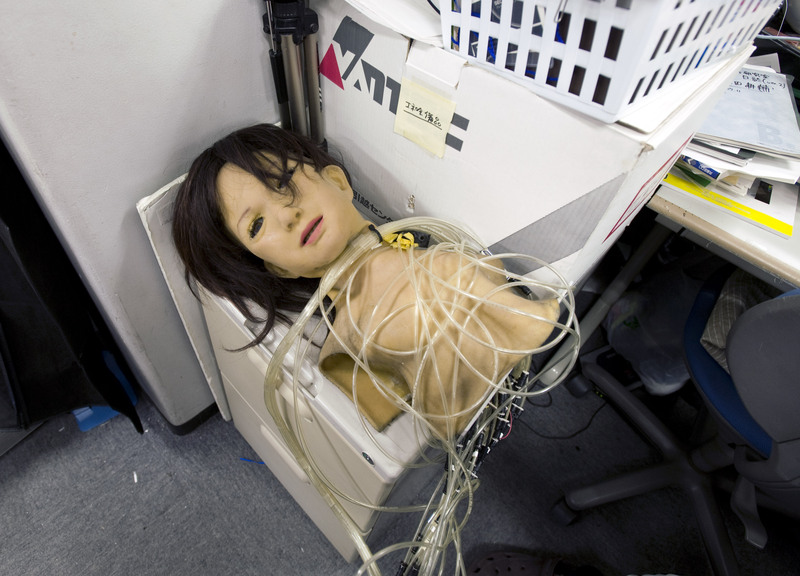 PAMs are also employed in another suit being developed by Toshiro Noritsugu and his team at Okayama University — though that one has no outer shell since its rubber actuators are fixed directly on to the body. One problem faced by all three Japanese developers contacted — Kobayashi, Yamamoto and Noritsugu — is realizing an optimal power source. When suits can be connected to air compressors in fixed positions in a factory or hospital then even the most bulky suits can be used. In more open environments, however, the versatility of the suits comes into question. Kobayashi and Yamamoto are currently trying to develop a portable power source using compact air cylinders, while a team at Tsukuba University in Ibaraki Prefecture under Yoshiyuki Sankai is getting round the problem in their Hybrid Assistive Limb (HAL) exosuits by using rechargeable lithium-polymer batteries that can last up to 8 hours. In addition to a full robot suit, Sankai has recently introduced versions targeting the nursing and medical industries. While “HAL for Wellbeing” is undergoing trials at 130 care facilities in Japan, “Medical HAL” has been introduced to a handful of hospitals in Germany and Sweden. From there, providing it obtains official clearance, its next stop is the U.S., Sankai says. 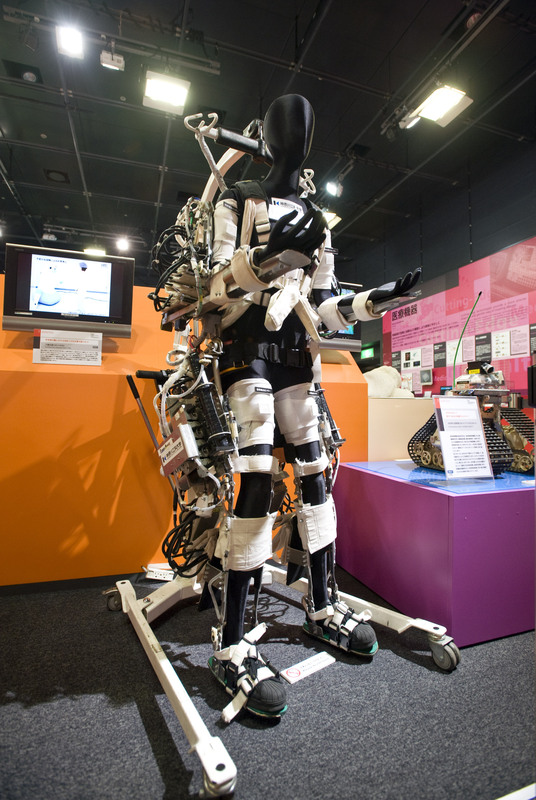 His plastic and extra-super duralumin exoskeletons weigh up to 15 kg and are mobilized by the power packs and an onboard computer that monitors nerve signals sent from the brain to the muscles to predict user movement. Instead of PAMs, motors located at key joints serve as actuators, their effectiveness demonstrated last summer when a HAL wearer carried a disabled person up the 1,000 steps of Mont St. Michel in France. 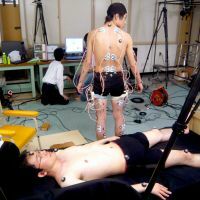 “Now the suits are in the hands of specialists, but by gathering data and other information from them and from the users themselves, we can finely tune the devices for household use to improve the quality of life of bedridden individuals,” Sankai said. He added that other developments mean the suits can also be used with even severely brain-damaged individuals. clean up the damaged Fukushima nuclear power plant can weigh up to 60 kg, but HAL could shoulder the full burden, allowing workers to concentrate on the work at hand,” Sankai commented. Some experts believe that within a decade, robo-support devices will be a regular feature of society, at least in the welfare industry. 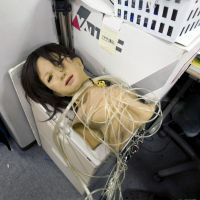 Their form, however, is likely to differ greatly, says Shiro Sekiguchi, head of the Nursing Care Robot Promotion Project in Kanagawa Prefecture. Materials and techniques used may also change, allowing greater autonomy for users, says Okayama University’s Noritsugu. “Human-power-assist systems must operate according to a user’s intentions, and I think nanotechnology might be useful to develop sensors to measure those intentions and to convey bio signals — for example, brain waves, and so on,” he said. Meanwhile, KAIT’s Yamamoto says that despite the greater autonomy such future advancements would provide, he doubts the role of caregiver will ever be negated.